Trump has pledged to “take care” of Pat McCrory, a source tells The Charlotte Observer. 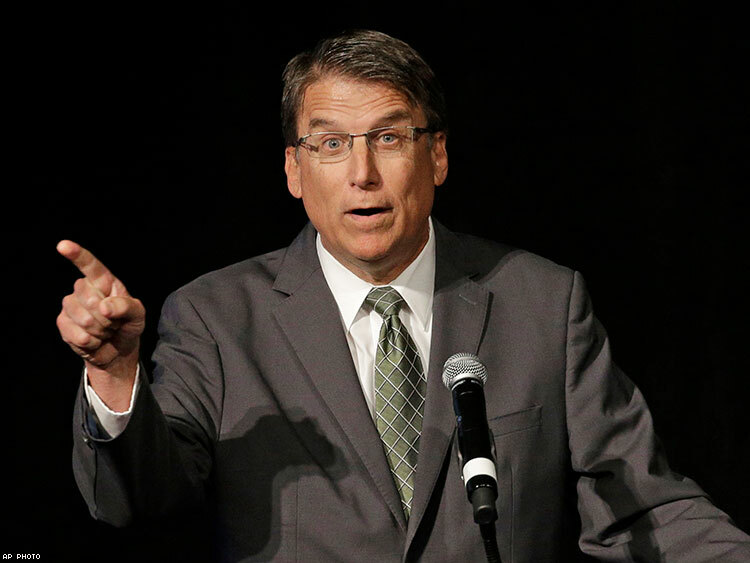 Pat McCrory might get his Carolina comeback after all. President-elect Trump's transition team, who met with the embattled North Carolina governor last Wednesday, has reportedly pledged to take McCrory under its wing, saying he “definitely” has a place in the Trump administration. An anonymous source familiar with the transition effort told The Charlotte Observer that it’s a done deal. “They’re definitely going to take care of him,” the source said. Last week’s meeting at the Trump Tower was just one of two encounters between the two men following the 2016 election, in which McCrory was the only governor to lose his bid for reelection. McCrory, who the president-elect called a “loyal Trump supporter from day one,” appeared at a stop on Trump’s victory tour in Fayetteville the day prior to their sitdown. Trump is perhaps being effusive in his statement about McCrory’s support, as the two men have had a rocky relationship. The businessman, then running for the Republican nomination, criticized House Bill 2 after the legislation was passed in March. The law, which forces transgender people to use bathrooms in goverment buildings that do not correspond with their gender identity, also keeps municipalities from enacting or enforcing LGBT-inclusive antidiscrimination laws. Trump was referring to the business and tourism the state is losing. It stands to lose $5 billion every year HB 2 remains law, estimates the Williams Institute, a pro-LGBT think tank at the University of California, Los Angeles. Trump, however, backed off his criticism of HB 2, later stating that he believes bathroom policies should be left up to states and localities to decide. “He does stand strong on certain issues that need to be said, especially from outside Washington, D.C.,” the governor said, pointing to Trump’s promise to force Muslims to enroll in a national registry if elected president. Although the source didn’t say which posts the Trump transition team is considering McCrory for, the Observer notes a number of possibilities. The president-elect has already made his Cabinet picks for the Departments of Commerce, Energy, and Transportation, but McCrory could land a lower role in the offices. The governor could also find himself with a key role in the Federal Emergency Management Agency. If McCrory does indeed join Trump’s White House, it may be a bit of destiny for the soon-to-be-unemployed governor. Prior to the passage of HB 2, conservative pundit Ann Coulter floated the North Carolina politician as a possible vice-presidential pick for Donald Trump, then in the early months of his campaign. In December 2015, Coulter tweeted a Huffington Post article in which McCrory mocked gender studies programs at state universities. Neither McCrory nor Trump has commented publicly commented on their meetings.